All long strips are now split to individual 300dpi pages. 4 episodes affected in 30 languages per episode. Over 500 files manually edited and fixed. The renderfarm script is now adapted ( simplified ). This was a massive work of hundreds of hours. 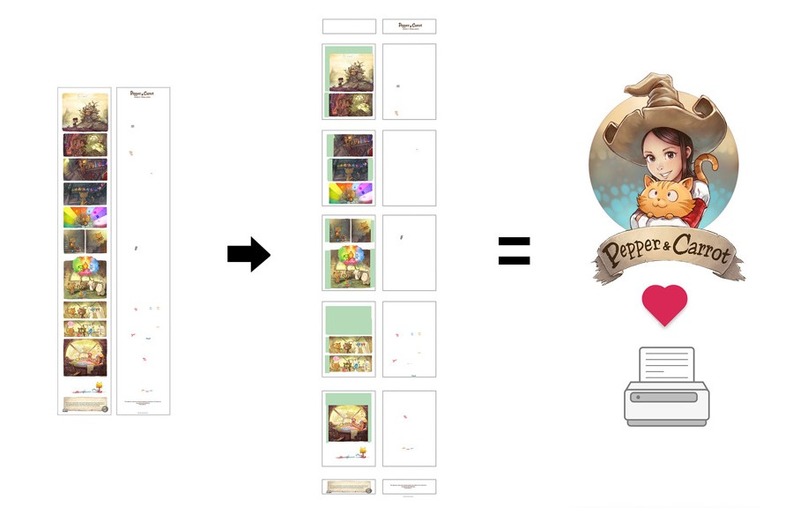 Problems: It was a single long strip designed for web in first age of Pepper&Carrot. - The panels are now wider and were patched to extend to the new panel size. - The last panel takes now a full page. A starfield was added to fill the empty space. - Three moon corrections to fit with the cosmology of Hereva. - No more green panel border. Panels color are white to respect a standard. - Drawing a new panel on page 4 was necessary to fill the page. - A lot of panel extension painted on the top for wider panels. - No more foggy border, back to a solid square design. ( foggy rounded panel are for flashback or dream ). Problems: Page 2 was irregularly sized. - Page 2 first panel was extended and recolorized. - Page 2 : speech balloon position were modified a lot. Problems: Last panel twist (page 4 ) was a irregularly sized page. - A new panel was added, a close-up on the house. Many details were added. It's now a 'zoom out sequence' of panel. Now Pepper&Carrot pages are all 2481x3503pixels, sRGB, 300dpi. License: CC-BY David Revoy, www.davidrevoy.com, 7 january 2016 . Wow ! That's a huge work you have achieved ! And I guess that wasn't very fun to do. I'm glad to you for this cleaning task. I intend to print a comic book of P&C with my own project when it will be finished (at the end of he year, I hope). @Jo , @Ncarrier : Thank you :) Yes it was a really repetitive task over hours and hours. But it feel good when all is over :) A printing project? very cool ! I'll just print it for my personal use. Great (and massive) job. Also, cheers for the mini set of brushes you just released.